I may be home sick today, but these socks are enough to perk me up a little. Knit from Crazy Zauerball. Pattern is V Junkie by Alice Wu from her book, Socktopus. I’m so glad I finished these last night. I love your socks!!! I hope you feel better soon, looking at your feet should give you a smile. they look guaranteed to make someone feel better. Hope they do their magic. I love the color of the socks! Just what you needed to brighten your day! I hope you feel better! Hope you’re feeling better :). Love the socks and the cheery colors! so great to have a rainbow on your feet!! 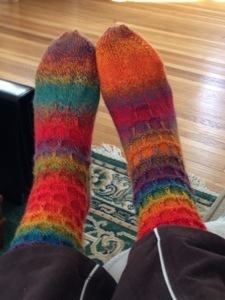 Do your feet enjoy the yarn ? LOVE!!! So sorry you’re sick too though. That’s no fun. But those socks sure are!! Q – Beautiful! I LOVE Crazy Zauerball yarn! Crazy Zauerball always packs a surprise for me inside. Nice socks 🙂 Hope you’re feeling well ❤ Can’t have cold feet, especially with a wedding coming up!